We had heard so much about Marmalade that when some friends organized a dinner there a few weeks ago, we readily agreed. We went to Old San Juan on a Wednesday evening and after walking up and down Calle Foratleza, we finally found Marmalade. We got there first so we waited at the bar for the other two couples to arrive. As soon as they got there, we were led to a quiet corner table right by the wine cellar. The cuisine at Marmalade is sort of modern Mediterranean with an extensive menu which they encourage you to try either in a four-course, five-course or six-course tasting menu. There is also the Marmalade 10-course degustation which can be enjoyed with a matching wine per course. We all thought that was too much food for a mid-week meal so five of us opted for the five-courses and one for the four-course menu. The good thing is that each one gets to choose two appetizers from their long list followed by the white bean and truffle soup, a main course and a dessert. The portions are adjusted for the multi-course menu so they are smaller than an a la carte portion. After reading through the menu, we finally made our choices and started the first of two bottles of Pulenta Estate Malbec from Mendoza. 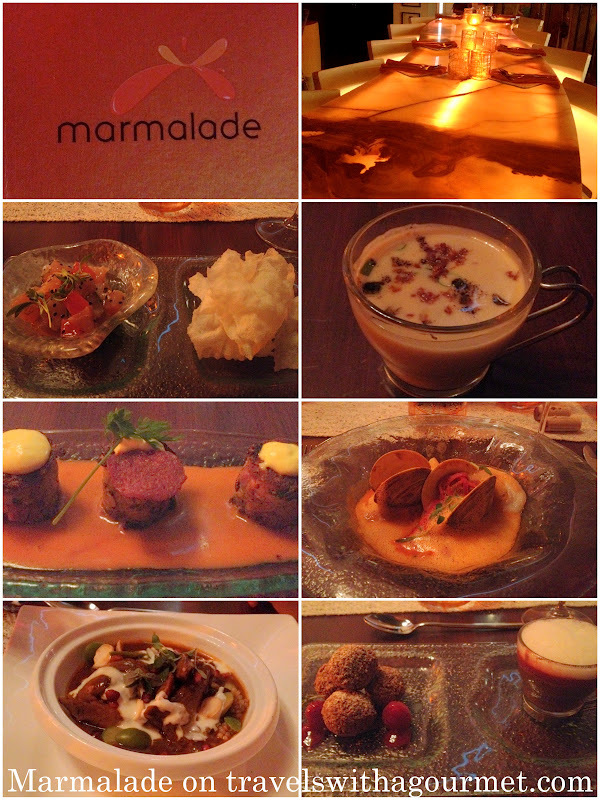 I made sure to choose three dishes that were listed in the 10-course tasting menu so I knew that I was trying Marmalade’s recommended dishes. I started off with the tuna – chunks of sashimi grade tuna tossed in sesame seeds, sesame oil and lime which came with a crispy rice crackers, This was followed by the unique paella appetizer – three crispy individual bites of saffron rice (sort of like risotto cakes) topped with a sliver of chorizo and some aioli. Next was their signature white bean soup which came in an espresso cup, scented with truffle oil – a richly flavored mushroomey cream complimented by tiny crispy bacon bits – my favorite dish. For my main course, I chose the seafood special – an Andalusian-style cod asopao (Puerto-rican style soup) in a red pepper and saffron-based frothy broth, topped with clams. Finally for dessert, I had the cheekily named coffee (not really coffee but a chocolate pot de creme served in another espresso cup so it looked like coffee) and donuts (chocolate raspberry macadamia beignets. We were almost the last ones at the restaurant when we finally decided to head back to Dorado. All in all, a lovely dinner getting to know new friends and talking about anything and everything and a sign of more good times to come. *Dinner daily. Open till late on Fridays and Saturdays.